On Sunday, October 29, 2017 reSound, A Northwest Chamber Ensemble alongside reSound’s Composer-in-Residence, Michael Austin Miller, reSound’s Director, Dr. Stephen Marshall-Ward, the Skyros Quartet, Kyle Erickson, Trumpeter, Steve Thoreson, Tenor, and Andrew Marshall, Sound Healer presented a powerful concert around the themes of Reformation, Death, and New Life: “Reformed & Reforming, Celebrating the 500th Anniversary of the Reformation” at Trinity Lutheran Church in Lynnwood, WA. 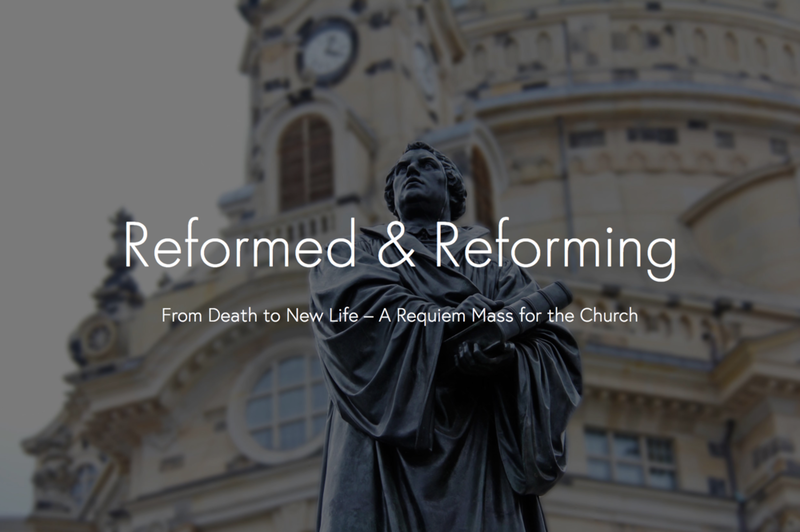 This concert included the world-premiere performance of a new 40-minute work composed by Michael Austin Miller and Dr. Stephen Marshall-Ward: Reformed and Reforming: From Death to New Life, a Requiem Mass for the Church. Sunday, February 11th, 2018 performance by Organ Duoists Wanda Griffiths and Stephen Marshall-Ward with reSound, A Northwest Chamber Ensemble, Kyle Erickson, Trumpeter, Mary Walters, Cellist, and Michael Miller, Conductor.